COLUMBIA, S.C. (August 30, 2010) - The South Carolina State Election Commission this week is kicking off a month-long effort to encourage South Carolinians to prepare for the November 2nd General Election by registering to vote or, if already registered, updating their voter registration information by October 2nd. "Voting is the quintessential American way for citizens to make their voices heard in our system of government," said Marci Andino, executive director of the State Election Commission. 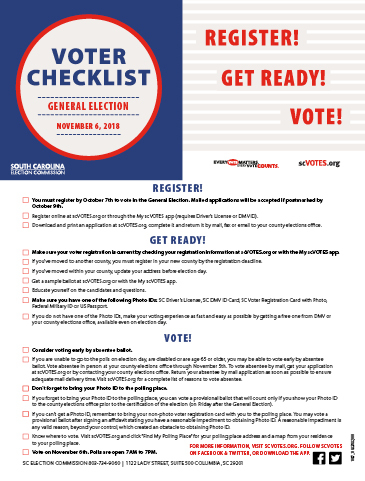 "Voter Education Month is a great way to remind voters to make sure they are properly registered, to help them prepare for Election Day, and to reinforce the fact that Every Vote Matters and Every Vote Counts in South Carolina. Must Article I of the Constitution of this State, relating to the declaration of rights under the state's constitution, be amended by adding Section 25 so as to provide that hunting and fishing are valuable parts of the state's heritage, important for conservation, and a protected means of managing nonthreatened wildlife; to provide that the citizens of South Carolina shall have the right to hunt, fish, and harvest wildlife traditionally pursued, subject to laws and regulations promoting sound wildlife conservation and management as prescribed by the General Assembly; and to specify that this section must not be construed to abrogate any private property rights, existing state laws or regulations, or the state's sovereignty over its natural resources? A ‘Yes' vote will make it a constitutional right for citizens to hunt and fish and will permit the State to legally provide for proper wildlife management and the protection of private property rights. COLUMBIA, SC (June 22, 2010) - Reports from election officials throughout the state indicate that statewide turnout in today's Primary Runoffs has been light so far. However, there are reports of moderate turnout in some counties and precincts where local races are driving voter interest. Voters have until 7:00 p.m. to vote. Voters in line at 7:00 p.m. will be allowed to vote. 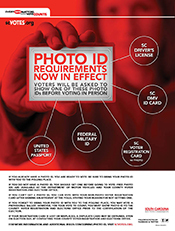 Since introducing a uniform electronic voting system in South Carolina in 2004, the South Carolina State Election Commission has worked tirelessly to build and maintain voter confidence in the integrity of the South Carolina voting process. We have worked to ensure that voters know how to use the new electronic voting equipment and understand their voting rights; and have continued to encourage greater voter participation. As we prepare for the June 22 Primary Runoffs, we want voters to know that we are confident in the integrity of our state's voting system and that security of South Carolina's voting process has always been - and will always be - a primary focus of the State Election Commission. Our state has a proud history of safe, secure and accurate elections and South Carolinians can be assured and confident in the system's ability to perform in the Runoff as it has thousands of times before - accurately and reliably. COLUMBIA, SC (June 14, 2010) - The State Election Commission wants to remind voters of impending deadlines for voting absentee in the June 22nd Primary Runoffs. In Person - Visit your county voter registration office, complete an application, and cast your ballot. You may vote absentee in person up until 5:00 p.m., Monday, June 21st. By Mail - Step 1: Contact your county voter registration office to request an absentee ballot application. You may make the request in person or by phone, mail, email, or fax. Step 2: You will be sent an application. Step 3: Return the completed application to your county voter registration office by 5:00 p.m., Friday, June 18th. You may return the application in person or by mail, email, or fax. COLUMBIA, SC (June 8, 2010) - Reports from election officials throughout the state indicate that so far turnout throughout the state has been low to moderate. However, there are reports of moderate to heavy turnout in some counties and precincts. Historically, primary turnout is lower than that of general elections ranging from 18% to 26% over the past 12 years. Turnout in General Elections has ranged from 45% to 76% during that same period. Polls close at 7:00 p.m. Voters in line at 7:00 p.m. will be allowed to vote. 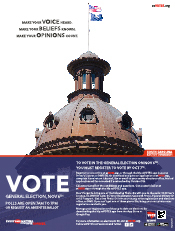 The State Election Commission will report election results and voter turnout tonight at www.scVOTES.org. Look for the 2008 Primary Results link on the front page. 1. 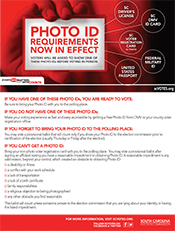 Voters are required to show any one of three forms of identification in order to vote: voter registration card, driver's license, or a DMV-issued ID card. COLUMBIA, SC (June 7, 2010) - South Carolina voters go to the polls on Tuesday, June 8th to vote in the Republican and Democratic Primaries. Below are some of the most frequently asked questions regarding primaries. 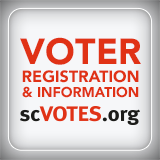 Visit www.SCVotes.org and use the "Check Your Voter Registration" tool found under "Voters" in the menu. 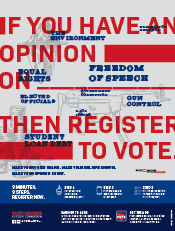 Your voter registration record includes your precinct and polling place. Call your county voter registration office. COLUMBIA, SC (June 2, 2010) - The State Election Commission wants to remind voters of impending deadlines for voting absentee in the June 8th State Primaries. In Person - Due to risks associated with voting by mail at this late date, this is currently the recommended method of voting absentee. Visit your county voter registration office, complete an application, and cast your ballot. You may vote absentee in person up until 5:00 p.m., Monday, June 7th. Step 2: You will be mailed an application. COLUMBIA, SC (May 20, 2010) - The State Election Commission wants to remind voters of the procedures and upcoming deadlines for voting by absentee ballot in the June 8th State Primaries. COLUMBIA, S.C. (May 3, 2010) - To help ensure the upcoming State Primaries run as efficiently as possible, the State Election commission wants to remind everyone of upcoming voter registration deadlines and urge those already registered to update their information. Those who wish to vote in the Primaries on June 8th must be registered by May 8th. Voters who have moved from one county to another must be registered to vote in their new county by May 8th.